Bar open Sun–Thu noon –11.30pm, Fri/Sat noon–1am. 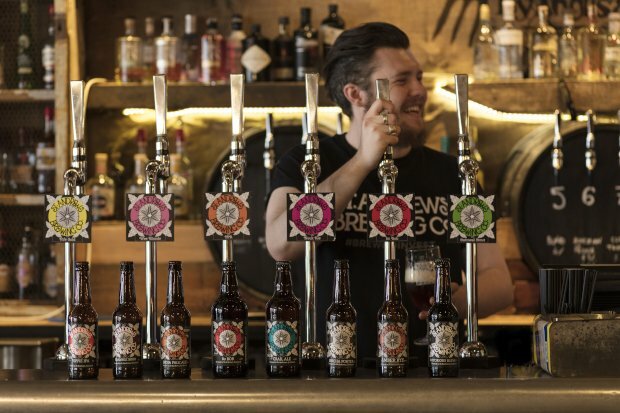 New owners St Andrews Brewing Co promise the best of Scottish gin, beers and malts plus a new-look menu at the former Potting Shed. Craft brewers St Andrews Brewing Co have been expanding into pubs, with the Potting Shed a recent acquisition. They’ve removed the central bar and made general improvements but otherwise have more or less kept the quirky, wooden, shed-based décor – why wouldn’t they? They’ve introduced a list of 15 or so mainly Scottish craft beers on tap and lots of bar staff with beards and tattoos. You can choose between an ambitious dinner menu, with mains like braised beef shin or salt-baked beetroot, or a varied bar menu including pizza, fish pie and mac and cheese. The wines are tempting and the cocktails even more so – Fiery Irn-Bru Sour, anyone? Throw in the lively atmosphere and this bar has it all.